We all know the Iranian M.O. — nuclear proliferation, Holocaust denial, threats to wipe out Israel, vicious anti-Western rhetoric, lavish sponsorship of terrorists at work attacking Israel and destabilizing Lebanon. If that were not enough, we now learn that Iran has been sending agents into Iraq to destroy the fledgling democracy and supplying sophisticated roadside bombs to blow up Americans. Lunatic state-run media keep boasting that Iran will kidnap American soldiers, shut down the Straits of Hormuz, send out global jihadists and raise the price of oil. Most international observers agree on two things about this loony theocracy that promises to take the world down with it: We should not yet bomb Iran, and it should not get the bomb. Yet the former forbearance could well ensure the latter reality. What, then, should the United States do other than keep offering meaningless platitudes about "dialogue" and "talking"? Imagine that Iran is a hardboiled egg with a thin shell. We should tap it lightly wherever we can — until tiny fissures join and shatter the shell. We can begin to do this by pushing international accords and doggedly ratcheting up the weak United Nations sanctions. 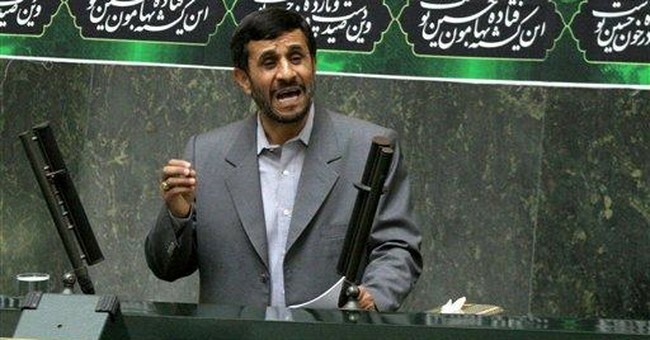 Even if they don't do much to Iran in any significant way, the resolutions seem to enrage Ahmadinejad. And when he rages at the United Nations, he only loses further support, especially in the Third World. We should start another fissure by prodding the European Union, presently Iran's chief trading partner, to be more vocal and resolute in pressuring Iran. The so-called EU3 — Britain, France and Germany — failed completely to stop Iran's nuclear proliferation. But out of that setback came a growing realization among Europeans that a nuclear-tipped missile from theocratic Iran could soon hit Europe just as easily as it could Israel. Now Europeans should adopt a complete trade embargo to prevent Iranian access to precision machinery and high technology otherwise unobtainable from mischievous Russia and China. Americans should continue to support Iranian dissidents. We need not encourage dissidents to go into the street, where they could be shot. Instead we can offer them media help and access to the West. Americans can highlight the plight of women, minorities and liberals in Iran — just the groups that so appeal to the elite Western left. And we should announce in advance that we don't want any bases in Iran, that we don't want its oil, and that we won't send American infantry there. That would preempt the tired charges of imperialism and colonialism. The United States also must stabilize Iraq and Afghanistan. The last thing Iran wants is a democratic and prosperous Middle East surrounding its borders. The televised sight of Afghans, Iraqis, Kurds, Lebanese and Turks voting and speaking freely could galvanize Iranian popular opinion that in time might overwhelm the mullahs. At the same time, we need to remind the Gulf monarchies that a nuclear Shiite theocracy is far more dangerous to them than either the United States or Israel — and that America's efforts to contain Iran depend on their own to rein in Wahhabis in Iraq. We should say nothing much about the presence of two or three U.S. carrier groups in the Persian Gulf and Mediterranean. Iran will soon grasp on its own that the build-up of such forces might presage air strikes that the United States excels in — and not more ground fighting that the American public apparently won't any longer stomach. We must continue to make clear that Israel is a sovereign nation with a perfect right to protect itself. Sixty years after the Holocaust, no Israeli prime minister will sit still idly while seventh-century theocrats grandstand about wiping out Israel. Let's also keep our distance and moderate our rhetoric. There's no reason to frighten average Iranians — who may share our antipathy to their country's regime — or to make therapeutic pleas to talk with those leaders in bunkers whom we know are our enemies. Finally, and most importantly, Americans must conserve energy, gasify coal, diversify fuels, drill more petroleum and invent new energy sources. Only that can collapse the world price of petroleum. When oil is priced at $60 a barrel, Ahmadinejad is a charismatic Third World benefactor who throws cash to every thug who wants a roadside bomb or shouldered-fired missile — and has plenty of money to buy Pakistani, North Korean or Russian nuclear components. But when oil is $30 a barrel, Ahmadinejad will be despised by his own masses, who will become enraged as state-subsidized food and gas skyrocket, and scarce Iranian petrodollars are wasted on Hezbollah and Hamas. None of these taps alone will fracture Iran and stop it from going nuclear. But all of them together might well crack Ahmadinejad's thin shell before he gets the bomb.